5. My household does not contain geniuses. (Everyone always thinks the other family is better -- smarter, closer, funner, etc.) I did score 4's on my A.P. tests in Calculus, English, and non-calc Physics. But I am by no means a genius, and neither are my kids and spouse. 1. I have better relationships with Mr. GAIN's cousins and my mom's cousins than they do. I actually meet and talk to them. And I'm really really good at remembering names and I like genealogy. 2. I used to edit and write a home school support group monthly newsletter. I think I did it for two years. With my solar car experience, I was able to boost the professionalism of it by leaps and bounds. Sadly, I have very few samples left. 3. We were in Amway for a few years. We thought it would be right to support Mr. GAIN's parents' efforts, since it was not illegal or immoral. It had pros and cons. We learned a lot -- about ourselves, about relationships, and about really good (diapers, dish soap) and really bad (diet food, cold cereal) products. OK, that's it for now. I don't have the brain cells for three more tonight. Maybe by Thursday. This will take some thinking. The part about writing on topics unwritten shouldn't be hard because both of my blogs are very focused. But the second part, well, people who know me, pretty much know a lot about me. But in the meantime, I am tagging Very Blessed Mommy and One Mom, Five Boys. I keep trying to modify a reversible cable pattern, and the stitches look good. The yarn does not. I'm trying to use a super bulky velour or velvet yarn, and the needles/yarn combo is not making a tight enough fabric to show off the cabling. So I've ripped the scarf out twice, at least. No pics. I've decided that the fabric will be too stiff if I change to a smaller needle, and have settled on a simple rib knit scarf, k2, p2 repeat. I hate to admit 'defeat.' The idea of a reversible cable is so cool. The idea of a snuggly warm velvet scarf is also cool. Or warm. I'll have to keep the reversible cable in long term memory. 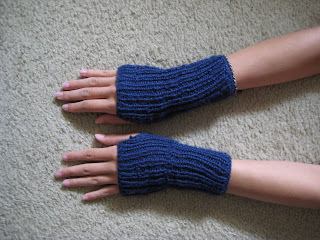 Hey, it's "A's" fingerless mitts. Pretty nice, eh? This is probably the most complex knitting she has done to date -- ribbing and sewing a seam. Not a lot going on -- A garage sale this weekend at my place, a campout for Mr. GAIN and "G," and perhaps some easy unfound geocaches for me. There are four in the area that I haven't found. Off the sticks last week -- another dishcloth. This time, I made a regular "grandma's favorite." I love that the pattern is incredibly easy. I first experienced this pattern at my wedding shower. A family friend from Matt's hometown gave me one, along with her church's cookbook. My goal is to have seven. I give about half of what I make away, so I may be reaching my goal of 7 by 2009. I found a knitting book at the library. It has a future Christmas gift in it. Now to just find the yarn. In another library book, I found a scarf that I want to make. Already have the yarn for that, now to burn some brain cells to modify the pattern to fit my yarn. 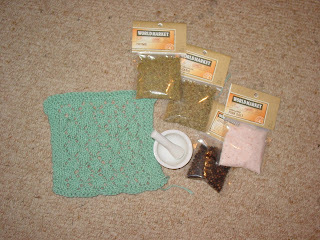 I'm also trying to use up my stash, so I also decided to make neckwarmers for younger nieces and nephews. The tester that I made failed the test. Why do things always work better in my head than in real life? Wow, I'm using a lot of short and simple sentences. Must be all the work of pricing garage sale items. Here is 'A Bedroom For Your Tiniest Doll.' She made this while I was with "G" at swim lessons. That means that I was gone when she did this. 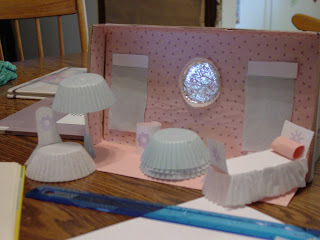 We were really impressed when we walked in the door and saw this, because when we left, she was in the kitchen with the book, 50 paper baking cups, stickers, a bag of 25 lollipop sticks, a paper cutter (it really needs a new blade), a shoe box, and a couple partial sheets of pink paper. It does not require the mental alertness that some patterns do, yet it is varied enough to keep boredom away. I used less than a week of nightly knitting to finish this cloth. You can see that I must have dozed off somewhere near the end of making it, because the pattern doesn't look quite right. But hey, it's a dishcloth, not a church sweater! I also included the rest of his gift in the photo. He's into cooking, so a mortar and pestle (ah, the days of my ceramic engineering education flash before my eyes) and spices made their way into my shopping bag tonight. The website above has a lot of patterns. You must remember to add your own border, and usually have to figure out your own preferred width and length of dishcloth. That means that the price for this site's patterns is the mental prep work. I have added more pics to the cherry jam article. 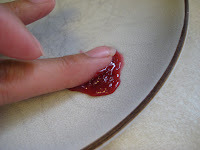 How to Make Cherry Jam. First you want to wear dark clothes, as in black, even if you wear an apron. You may also want dark kitchen towels. 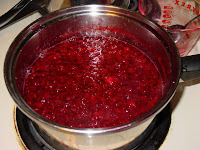 Start with a large cooking spoon, clean jars with seals and lids, two lemons, a zester and reamer, white sugar, cherries, almond extract, a small pot for cooking, and a large pot for the jars and lids. Fill the large pot with water and stand the jars and lids in it. Simmer until ready. 1. Pick cherries. We've kept them covered in the refrigerator for up to a week. 2. Clean and pit them while wearing your dark clothes. Endure bad cherry-related jokes from the seven year old. You can use a knife or a cherry pitter. Some stones will have "dirt" on them. Not the dark color you get from air exposure, but dirt. The dirt is probably frass. Throw those cherries away. Chop the cherries that you saved. We used a food processor. 3. Dump pitted cherries in a pot. 4. Zest and juice two lemons. Add to pot. Cook until cherries and lemon juice mush up. 5. Measure the contents of the pot. Put it back in the pot. 6. 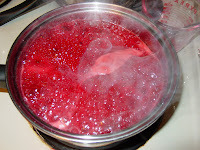 Add [0.75 x (lemons and cherries measurement)] sugar to the pot. 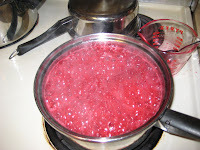 Example: for four cups of cherry mush, add 3 cups of sugar [(0.75 x 4 cups) = 3 cups]. Stir. Put a white plate in the freezer. Cook cherry mush over high heat. 7. Look for foam. Stephany says this is the natural pectin. 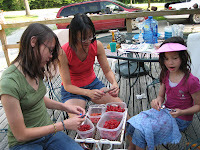 I liken this part to candy-making. The bubbles will not subside when you stir. They are smaller and paler in color than the bubbles in the next stage. Keep cooking. 10. Put a couple drops of almond extract in the jam. Stir. 11. Get a jar and lid from the pot of warm water. Wipe them dry. 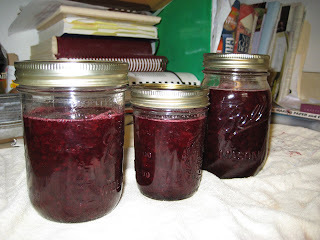 Ladle jam into jar. Clean the jar if needed. Put the seal in place. Screw on the lid. Cool on the counter. Enjoy "summer in a jar." Appreciate the high price of gourmet jams. 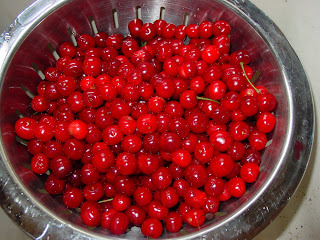 I am glad we picked cherries! Thanks, Sis. Update: The wristers are done. When we stayed in Wisconsin, we came in most nights once darkness fell. We read, played cards, and knitted until bedtime. 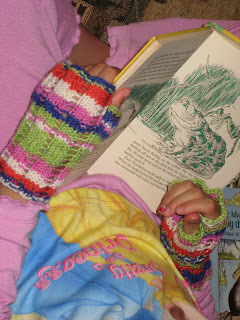 In this photo, "I" of GAIN reads while wearing her jammies and wristers. 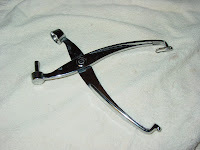 "A" of GAIN also made a pair of wristers in a rib pattern, a nice stretchy feature. She made them long, which is a very nice feature, and they are dark blue, another nice feature. For some reason, we have no photos, even though she wore them. I was happy that she didn't need any help making them. Veni, vidi, vici. My sister invited us to pick from her one cherry tree. We came home with a minimum of three gallons of cherries last Thursday. I came, I saw, I conquered. The kids and I left the tree empty on the bottom half. Of course, my siblings had already picked a lot in the days beforehand. After pitting for hours (thank you to my business partner for lending the cherry pitter), I have since made cherry-rhubarb crisp, crumb-topped cherry pie, and cherry jam. I was most interested in jam, as I am not real hip on cherry desserts. I think I had too many doses of slimy, overly-thick cherry pie fillings as a child. The homemade cherry desserts have been OK. In addition to being very interested in cherry jam, I was very nervous about it. 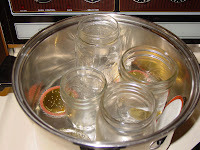 I had no experience canning, and it seemed intimidating. I remember having paraffin-topped jars of jam, but the extension offices scream about health hazards with paraffin. So I knew I needed something else, since my family didn't have advice for me. 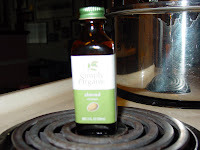 An internet homeschool friend sent a recipe, which I also found at this site, that seemed do-able for a newbie like me. I scoured my house for canning jars. I have always saved jars because I like the way they look. I had window sills full of glassware when we lived in Ames. I found more bands than lids, and more lids than jars. I now have two jars of rockin' cherry jam, made by myself. I have since bought more lids (seals) and boosted my canning confidence infinitely. I am learning all the time, loving it, and wanting to continue my learning.